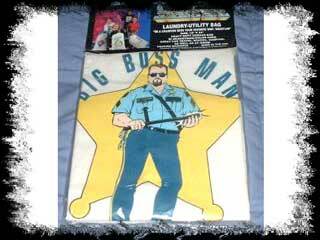 Someone Bought This Classic: Big Bossman Laundry Bag - WrestleCrap - The Very Worst of Pro Wrestling! RD: As sad as I was about the passing of Ray Traylor, I can sleep better at night knowing he was immortalized in a manner such as this. 16 Responses to "Someone Bought This Classic: Big Bossman Laundry Bag"
They had that same image (and other wrestlers) on a pillowcase/sheet set around the same time. I so want that laundry bag. “If you mix my colors and my whites and I end up with punk underwear, you’ll be serving hard time!”. I want that bag, too. I have a sleeping bag for kids from the mid-80’s. I had a WWF comforter that had this picture of the Bossman along with Hogan, Ultimate Warrior, LOD, Macho King, and the Bushwackers on it. Oh man, now I want to see a sitcom where The Twin Towers run a coin-op Laundromat. You could have had Moolah & Mae Young as the token “hookers with the heart of gold”, Bobby Heenan as the bumbling chief inspector. 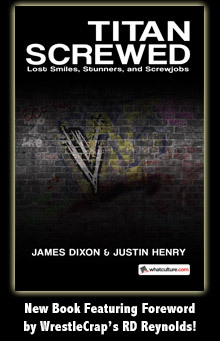 Monsoon as the lead coroner “he was struck in his external occipidal protruberance” , The Genius as the criminal mastermind behind every plot, Jimmy Hart as the squealer and Paul Roma as a jerk because he’s a jerk. Sounds like a great idea, but its no Fuji Vice. Perfect for carrying around laundry on that bicycle he got! This looks less lame than I expected it to from the description. Perfect for carrying sympathy cards. INDUCTION: AJ Styles vs. Larry Zbyszko – If You’re Dreading AJ vs. Shane, You’d Probably Best Not Read This!